Most of us have now resigned ourselves to bid farewell to the summer rays. At SkinFirst we know as well as any that the sun can be both friend and foe. It is beneficial to have some regular exposure to the natural vitamin D that the sun provides, but this is counterbalanced by the ageing effects that the UVA rays on the skin. The impact can be seen adversely in many ways, including unwanted pigmentation, thread veins, lines and wrinkles, slack skin, dehydrated and dry skin. The change in season and temperatures can also then exacerbate these skin conditions such that help is needed to restore vibrancy, and hydration. In addition the skin often needs some tender lifting firming and tightening, along with smoothing and plumping, to be restored to its former glory and beyond. Do not fear, SkinFirst are at hand to get your looking fabulous for the winter with efficacious, non-invasive treatments which work. We have a range of technologies to combat most skin concerns and all skin types. Our consultations are free of charge and we have some special Autumn offers from now until the end of November. A deeply hydrating facial package commencing with a deep cleanse using our H²O system combining high pressure oxygen and water, which can eliminate black heads and get the skin into squeaky clean condition. This is followed by an enriching and purifying clay mask (sulphate, soap, and paraben free) to detoxify, reduce the appearance of pore size, and improve circulation and luminosity. 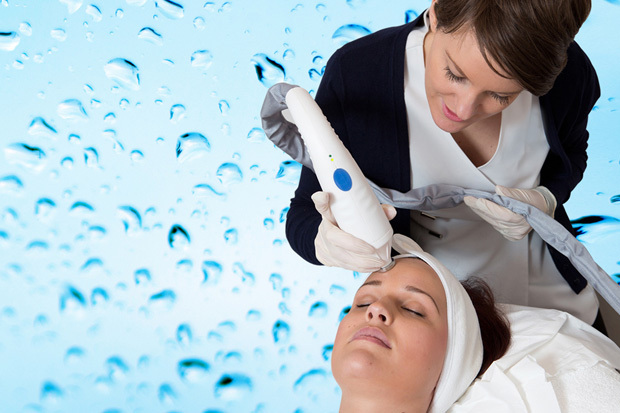 An advanced microdermabrasion facial using diamond tip (hence suitable for even the most sensitive of skins), a hot hammer to open the pores to receive penetrating cosmeceutical serums and a cold hammer to seal. £50/treatment. We have a 3 for 2 offer on all treatments. If you have 2 treatments together we will provide another (the least expensive) free of charge. For example if you have upper leg and bikini hair removal we will do underarms free of charge. Treatments can be mixed for this – so you could have a peel for example instead of underarm hair removal in the example above. Use your imagination and you can be looking amazing for even less. We would love to welcome you into our relaxing clinic and spa. Please call us on 01925 446688 or email contact@www.skinfirst.co.uk to come for a free consultation.